So you are ready to begin prepping. You've come to terms with whatever dangers may await and now the journey begins. It all starts with the hardest part of all. Where do I start? The internet is full of opinions on what are the most important items. Some things you need depend on what you are preparing for. Others will depend on whether you are choosing to Bug In (stay where you are and protect your home) or Bug Out (head away from home to the wilderness, an alternate property, etc). However, some things are universal. Regardless of where you are choosing to survive at, you will need food, water, a way to prepare food, and shelter. Now comes the tricky part. You decide you must begin stocking up on food and water, but what do you need? How much do you need? Most importantly, how can you afford it? I find this gets even more overwhelming when you begin to watch the prepping shows on the internet or tv. They all have years of food, but did they really get that overnight? In most cases, the answer is no. Before you get discouraged, just remember, the first and most important parts are to acknowledge the dangers and begin to take action. That said, let us begin with some simple prepping rules. 1. Store what you eat and eat what you store. While it is trendy (and sometimes handy) to have some pre-packaged survival food in the house, most people are not going to eat that unless they have to. There are many places that will sell you food that is dehydrated, freeze-dried, or even fully MREs. These are handy, but can be costly. Since you are prepping on a budget, and the idea of prepping is really self-sustainability, I would avoid these when getting started. You can always supplement your food supply with this stuff later. Begin with the basics. Everyone from NASA to FEMA suggests a 3-14 day supply of food and water on hand. This does not count whatever food you have in your pantry. How much food is that you ask? The opinions on this vary widely and many talk about calories and activity levels. For my family, we do not look at calories. We look at what we eat today. You know what a meal is. Plan for that and you will be fine. 2. Rotate your food supply. One of the common problems I see, is people buy some food, put it on a shelf in the basement and forget about it. This is bad. You must rotate your food regularly which is why Rule #1 applies. My family keeps one meal's worth of everything in the kitchen and the rest is in the stockpile. When you eat something, replace it from your stockpile and add it to your list to replace. Since you are starting on a budget, this is a great way to start. Most people cannot afford a double grocery bill every month. Therefore, pick your favorite meal from the grocery list and just buy double of that. Try to avoid perishables and anything that requires refrigeration or freezing. Once you have stocked up on canned goods, you can always look at ways to deal with other items. 3. Include some "special treats". In a hunkered down situation, morale will likely drop. The best way to boost this is to keep some things on hand that are your favorite snacks. I personally recommend some high sugar items like chocalate. Not only will it bring a bit of happiness to your life, the sugar may be well appreciated if you are living off canned foods only for awhile. 4. Don't forget the food preparation supplies. It does no good to have two weeks worth of soups on the shelf if you do not have a can opener or a way to cook the soup. For my money, I recommend having a camping stove and a charcoal grill. Canisters of propane (the 1 pound size) are relatively cheap and can last a long time. They are also multi-use. I have a heater that runs on the same canisters so I want to have as much propane as possible. They are also more portable than the big 20 pound tanks. I also prefer a charcoal grill. This is a second source of cooking and heat. Charcoal grills can also utilize wood if no charcoal is available or you can make your own. Something small that you can keep portable may also be an advantage if conditions change and you must move about. Of course if you are going to be using a grill or camping out, do not forget some waterproof matches as well. 5. Do not forget the water. Whether you buy bottled water or store it out of your tap, most experts say you need 1-3 gallons per person per day. Keep in mind, water is needed for more than just drinking. Cooking and cleaning are key at a time when living conditions may be less sanitary. The water where I live is less than desirable so I buy gallon jugs (by the case) and cases of bottles. Once the jugs are emptied, I do refill them with tap water and label them. This way, I do not have to use my expensive drinking water for things like cleaning or force flushing the toilet. These steps should get you started on your way. Next time, I will get into more specifics on what items I have in my stockpile as well as the next steps. 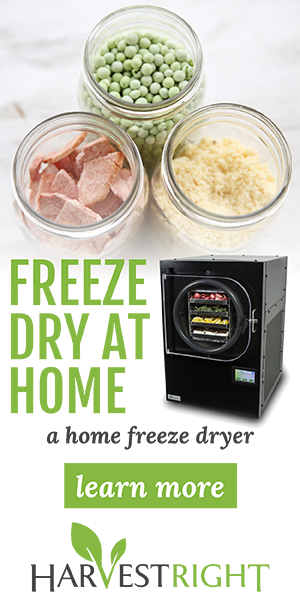 From there, we will talk about dehydrating, canning, and even freeze drying your own food as well as freeze dried products online.